Guess what? 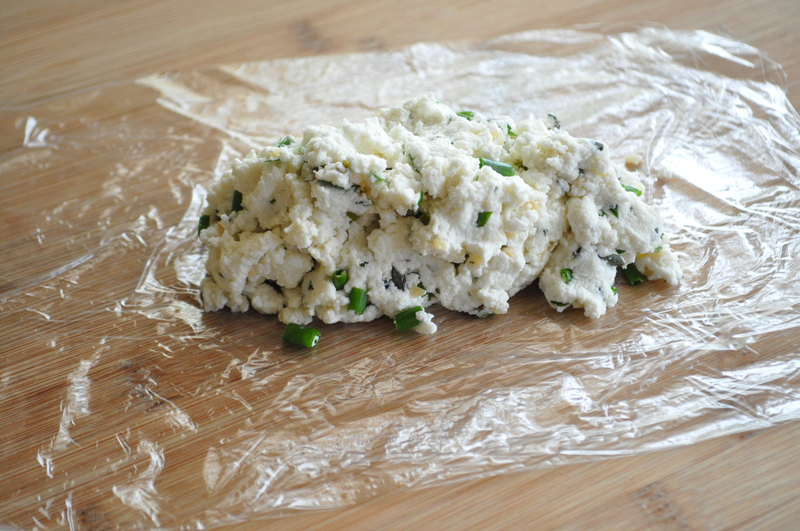 You can freeze goat cheese. Who knew? I had no idea. According to the internet, soft cheeses freeze quite well, actually. This opens up all kinds of ideas for different types of goat and sheep’s milk cheeses. This cheese is mild and delicious. Not overly “goaty” like a lot of aged goat or sheep’s milk cheese. Perfect on crackers, toasted baguette slices, on top of a baked potato, in your favorite salad, sprinkled over your favorite pasta dish…the options are endless. You can make it sweet with zest and agave nectar or savory with herbs and spices. 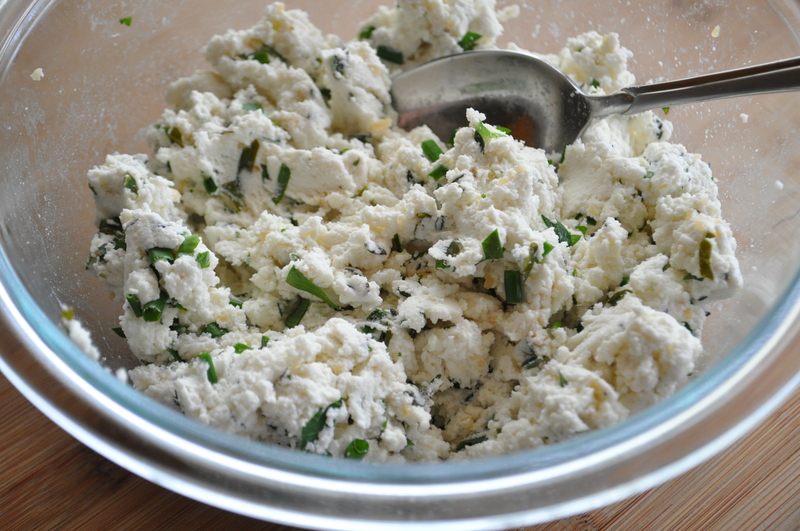 I’ve used sweetened goat cheese with breakfast crepes and it was amazing. Get creative! I have a new obsession. Making my own goat’s milk and sheep’s milk cheese! Once you try it, you won’t believe how incredibly easy it is. I’ve read that it’s important to use raw milk because pasteurized milk doesn’t clot the same way. 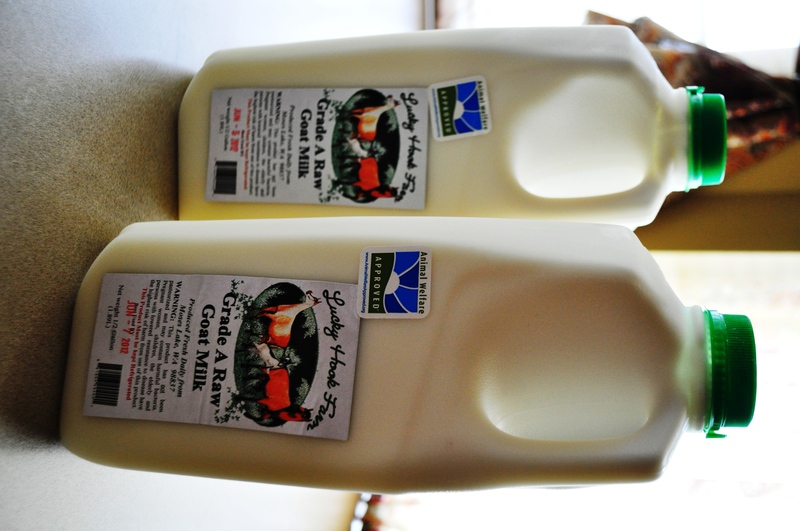 If you’re able, I would suggest trying to find a local organic farm where you can buy the raw milk. And then of course, use organic lemons and organic herbs. I buy organic and all natural whenever possible. It just makes sense to eat pure, clean, food as much as I can. 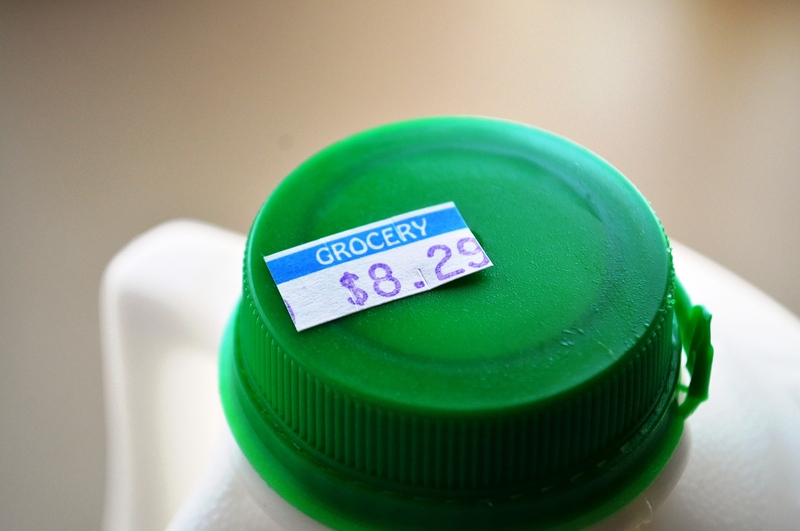 But as you probably already have experienced yourself…pure, locally grown food comes with a little sticker shock. I paid $16.58 for 1 gallon of raw goat’s milk. 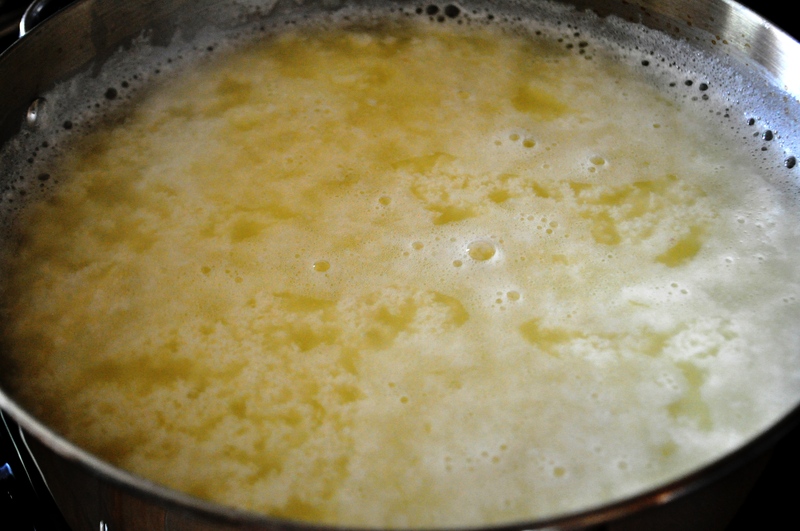 One gallon of goat’s milk made into cheese gives you about 12 ounces of cheese. That’s about $1.38 per ounce. Expensive, but really no more than you pay in a grocery store. And the satisfaction of making it yourself and knowing exactly what is in it and where the ingredients come from…priceless! 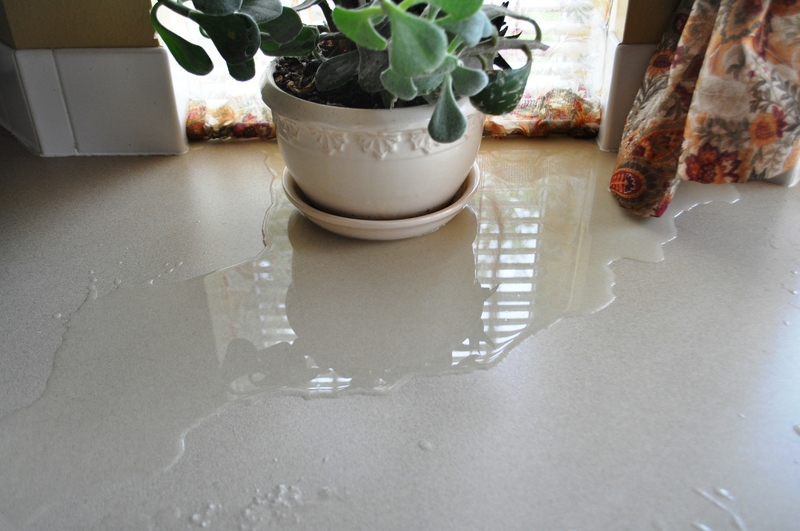 In a large dutch oven or stainless steel pot (do not use aluminum) add several inches of water and bring to a boil. Boil for about 5 minutes to sanitize. I carefully sloshed it up and around the sides. Drain, add the milk and salt, stir. Heat to 185-190 degrees stirring frequently. Keep an eye on it so it doesn’t scald on the bottom of the pan. 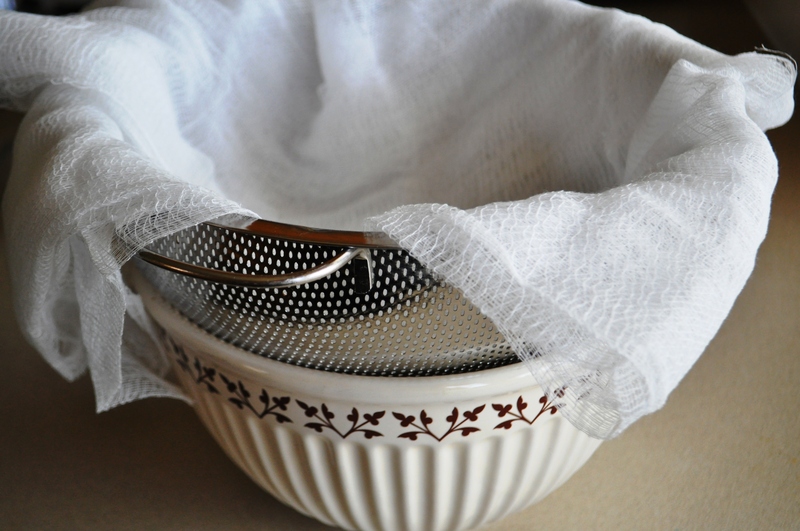 Meanwhile, line a large strainer with the cheesecloth. 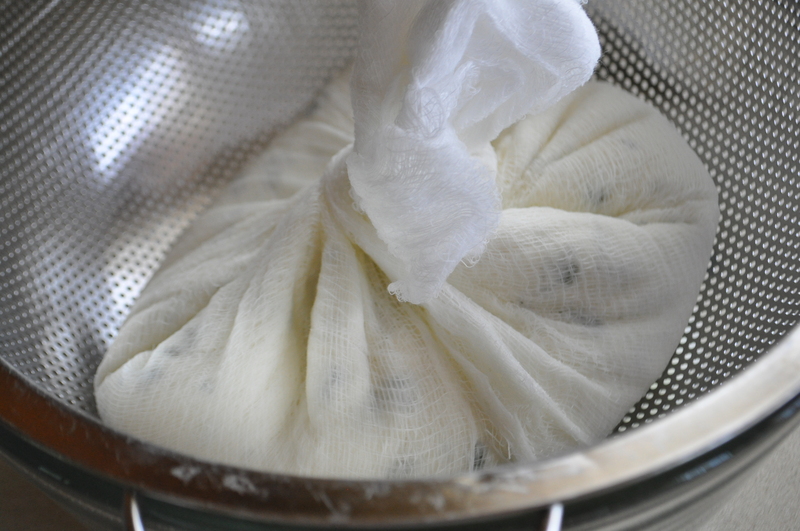 I used all of the cheesecloth in the small package I purchased. Just fold it over and make sure it drapes over the sides. 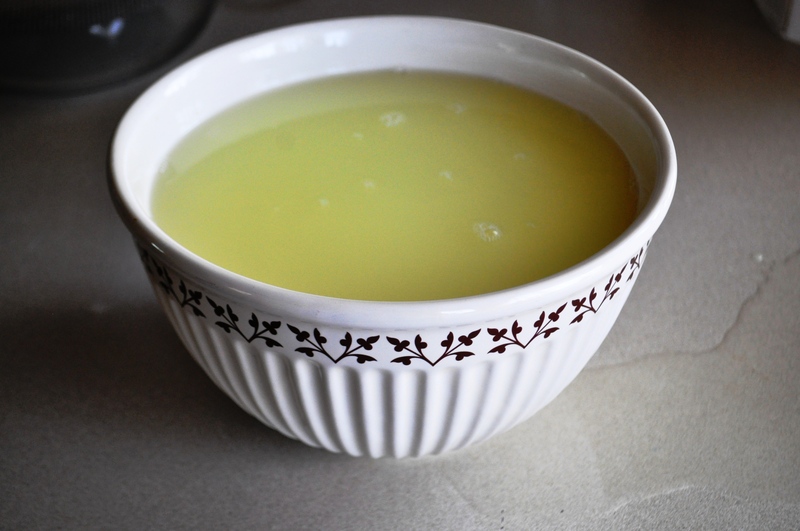 Place the strainer over a deep bowl. 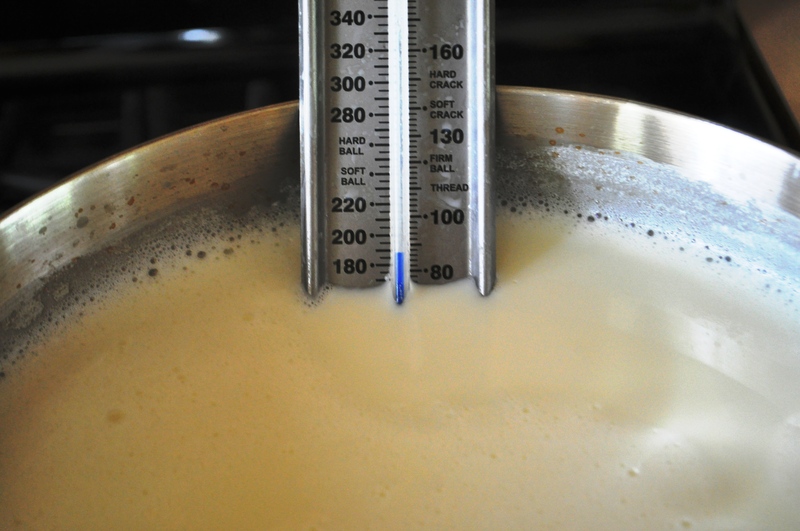 When the milk reaches 185-190 ish degrees, remove from heat. Slowly stir in the lemon juice. It starts to curdle right away. 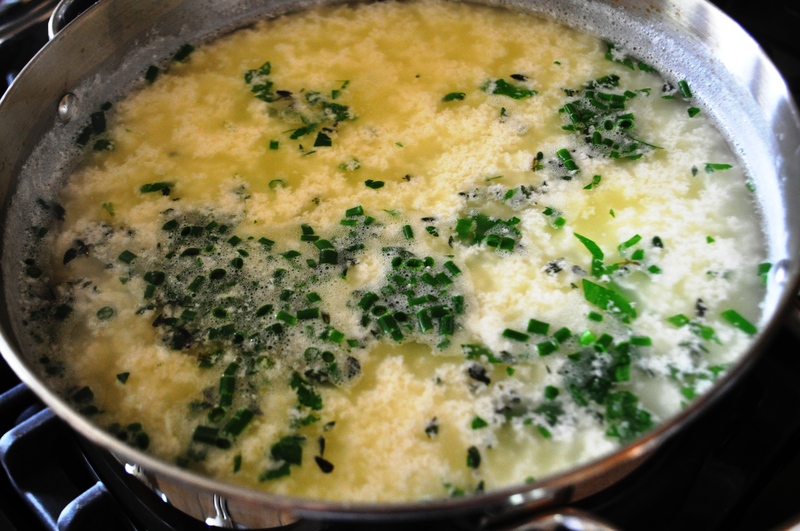 Add a pinch of parsley, chives, and thyme, reserving the rest for after the cheese has drained. Allow to rest for 25 minutes in the pan. After it has rested, pour slowly into the cheesecloth. Allow to drain for about 30 minutes. 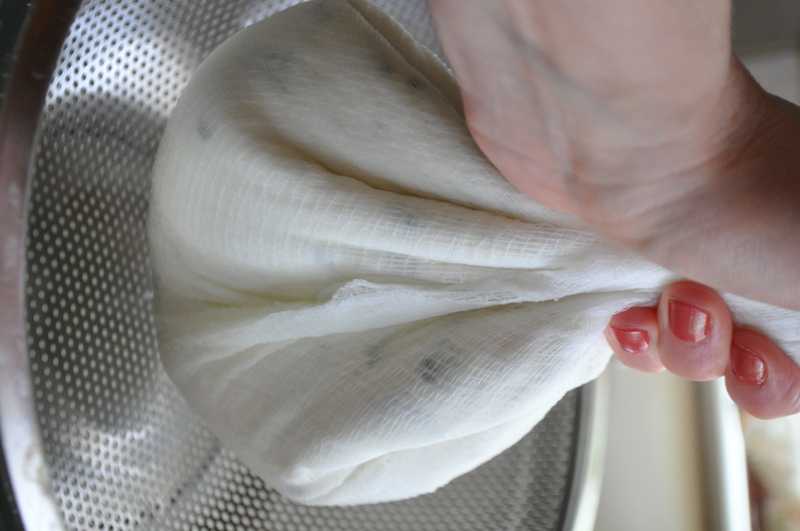 Carefully pull the sides of the cloth in and twist into a ball, carefully squeezing out some more of the liquid. Allow to rest and drain for another 25 minutes or so checking and draining the bowl every so often so that it is not sitting in its own liquid. 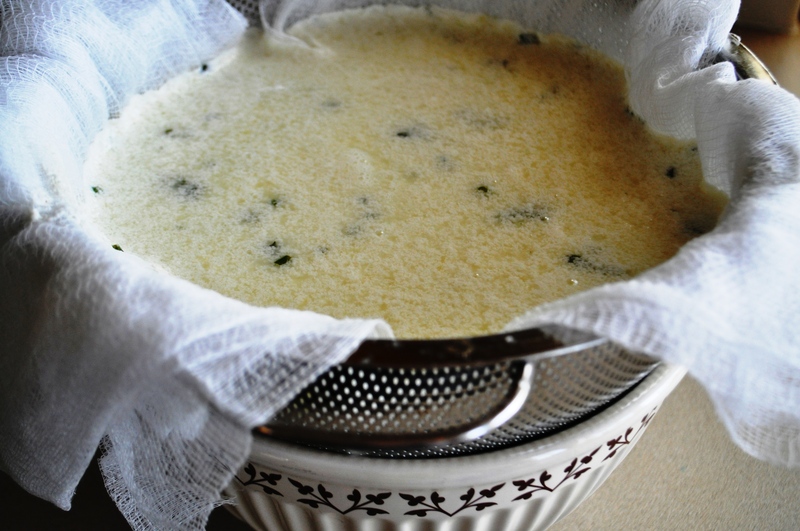 Remove the cheesecloth from the strainer and scrape the cheese off with a spoon into a bowl. Add the remaining herbs and garlic and stir to combine. Taste and add a bit more kosher salt and a few grinds of good peppercorns. On a clean working surface pull out a piece of plastic wrap and fold in half. 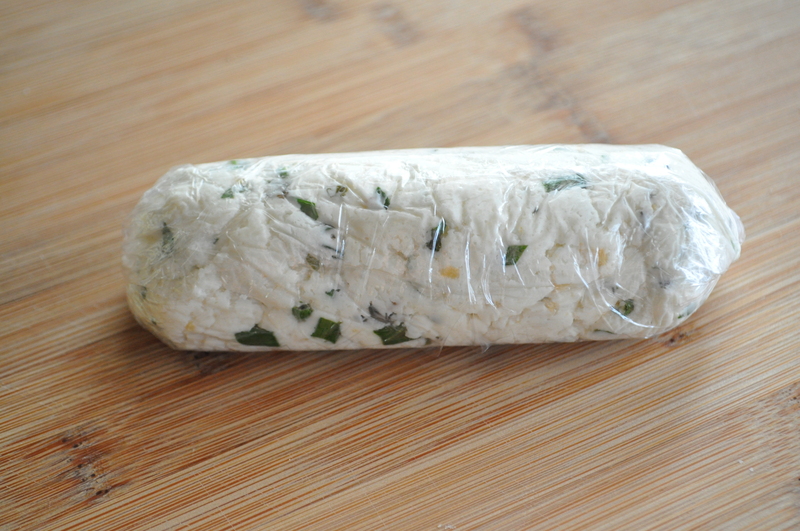 Spoon goat cheese onto the middle of the plastic wrap in a small row. Gently roll up one side of the plastic wrap and snuggle it over the log. Roll the log to the other end of the plastic wrap, twist the ends tight and tuck under. Continue to do this with the remaining cheese or if you’re going to use it within a couple of days, you can also make it into one large log or any shape you like, really. 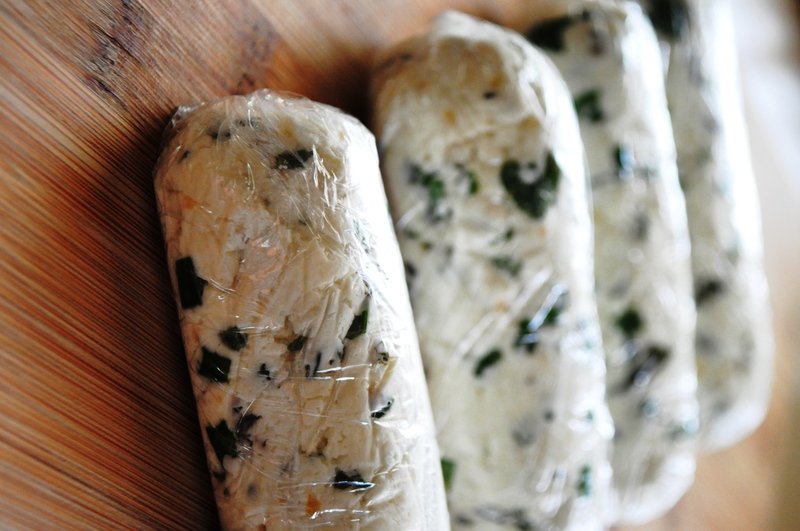 Once all of the cheese has been rolled, refrigerate for three hours. 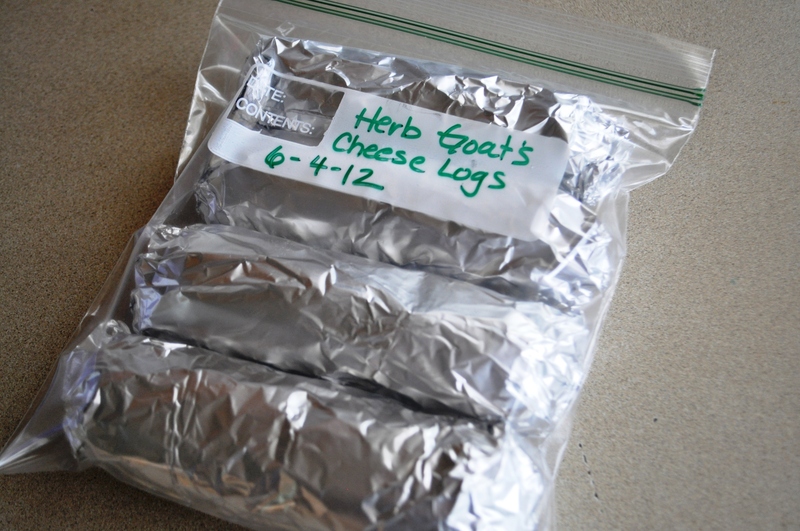 Remove from fridge, roll in one more layer of plastic wrap, cover in tin foil, enclose in a freezer bag and freeze up to one month. You can do the same thing with sheep’s milk and cow’s milk. It’s incredibly easy. You are so creative, I can’t believe you haven’t made your own cheese! I know you’re just sitting around twiddling your thumbs…never busy. Ha! Welcome to the cheese making club! 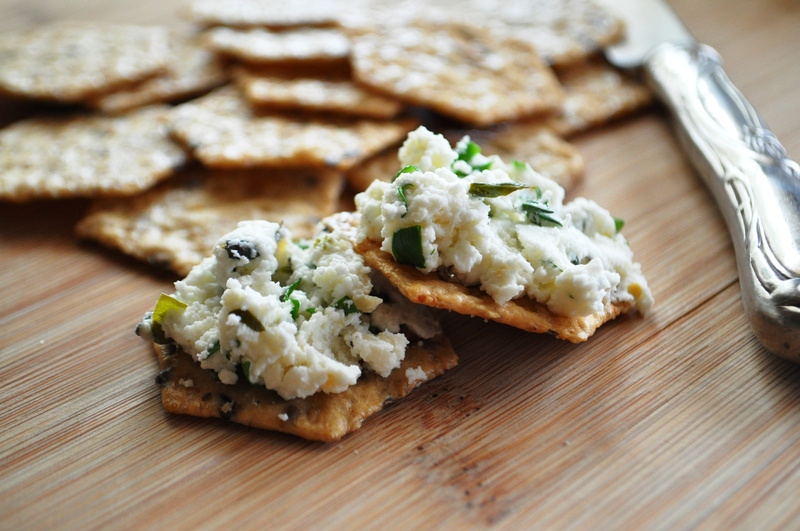 Your herbed goat cheese looks perfect! I envy you your access to raw milk. It’s illegal here to sell it. I know how to get around the curd problem but there is no way to get around the difference in taste when you use raw instead of pasteurized dairy. 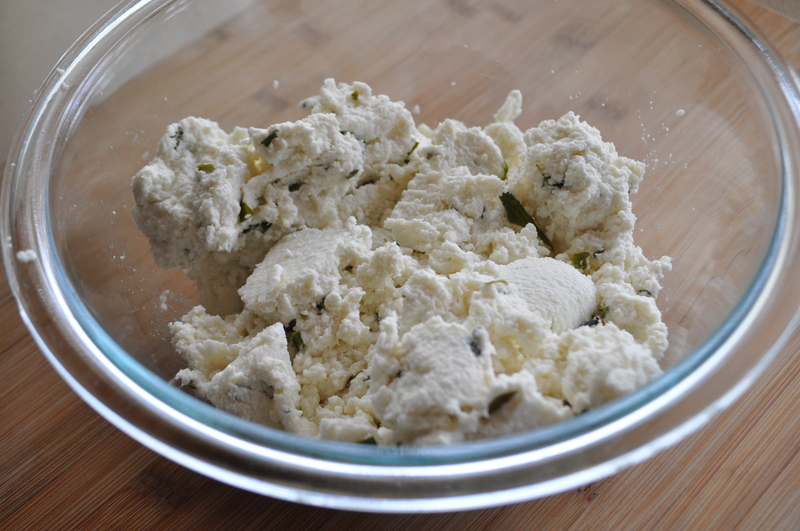 As it is, I’ve got a fridge full o’ feta and just made a batch of mascarpone that needs to be drained. This looks great! 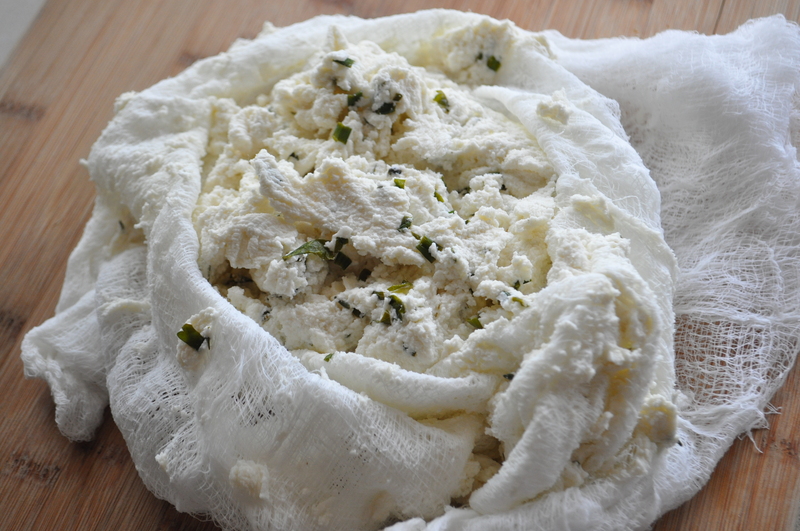 I make my own ricotta (from cows milk) all the time using a similar method, but I’ve never thought of using goats milk. Thanks for the recipe! Thank you so much for the nice comment! 🙂 And thank you for stopping by!